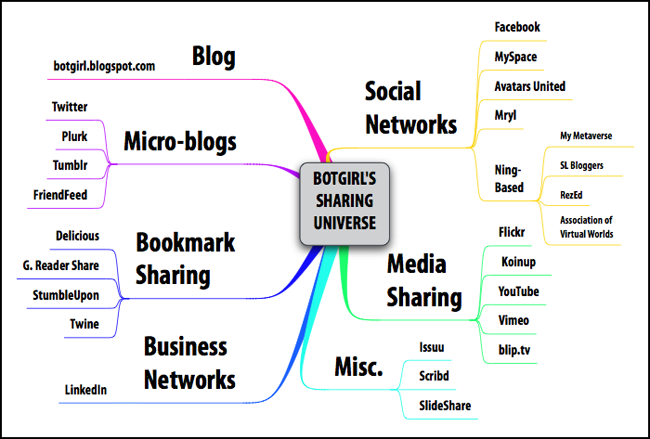 Just so you know I wasn't exaggerating yesterday, here is a depiction of the sharing-related sites I'm registered with. I'm sure I forgot a few. I'll continue the narrative in the next post. Very useful layout. This will actually help me to streamline and eliminate services that are redundant, as well as consider adding in areas I have overlooked. Botgirl--nice idea to use Novamind or similar. I made a ppt slide last year to try to show how all these are connected to each other, but I ran out of space! This is more compact.